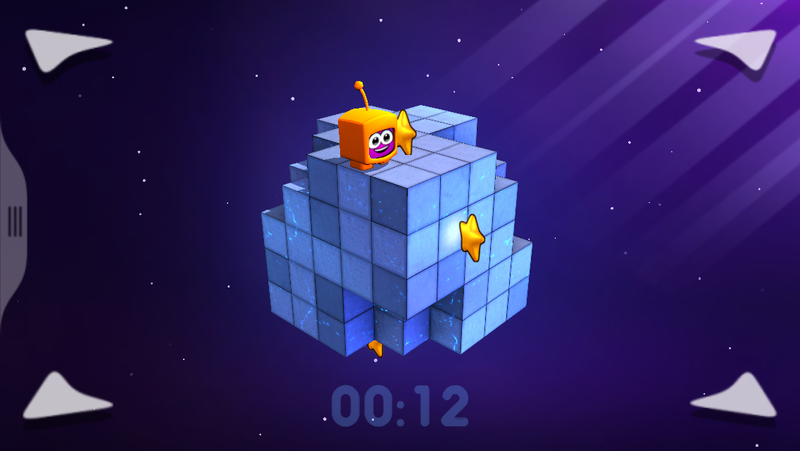 With as many puzzle-platformers as there are on iOS, a title really need to do something to earn some limelight. Crescent Moon Games‘ Twisty Planets ($0.99) earns its attention in a couple of ways. Its world-turning element is well done and certainly adds a different perspective to the genre. Meanwhile its variety in levels and emphasis on gradual difficulty give players motivation to continue playing. It all leads to a fun platformer worth enjoying. Working within small, cube-like levels, the objective of Twisty Planets is relatively simple. Guide your avatar, Qub, through each level collecting stars (three in total in each map). Collecting one star opens up the exit portal, while collecting all of them is primarily a completionist’s task (meaning it’s more for bragging rights and unlocking future worlds quicker). Fall off the world and you lose a star, and if you manage to lose all three stars before you get to the exit, the level is restarted. The complexity comes into play with Twisty Planets’ ability to shift the perspective of the world, effectively changing gravity. Swipe up, and the world shifts upward, opening new paths that were previously walls or ceilings in a different perspective. Since gravity does change, it’s important to place Qub in certain locations so that he doesn’t instantly fall off the face of the world when you shift. Thus, here’s where the puzzle element comes into play, as pretty much all the gameplay revolves around getting Qub into corners that keep him safe while twisting and shifting the planet’s perspective and gravitational pull, allowing him to access new areas and collect all the stars. If you’ve never played a game like this before, it can be a bit mind-twisting at first. While I don’t believe Twisty Planets introduces anything particularly unique to the puzzle genre, I still greatly enjoyed the experience. 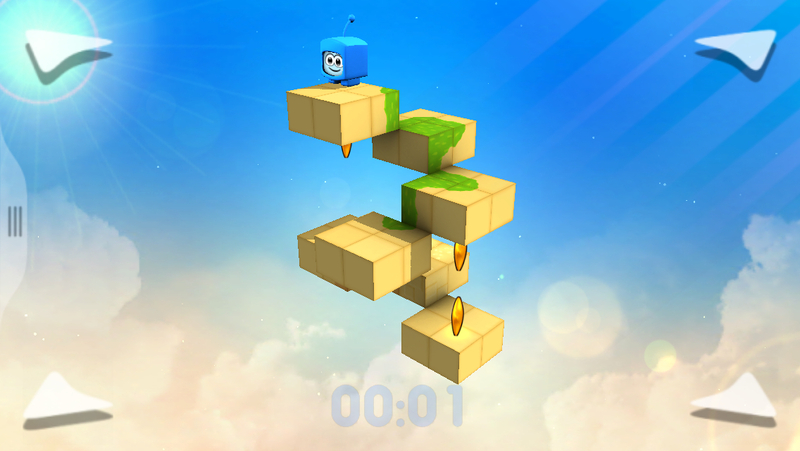 The combination of tightly constructed, relatively quick puzzles is perfect for the platform while the game’s primary use of gravity as the puzzle element is easy to pick up but is flexible enough to create some pretty difficult puzzles as players advance. Speaking of difficulty, I did eventually encounter some decent challenges with Twisty Planets, but they were never overtly frustrating and mainly required me to rethink the way I approach the worlds. Speaking of difficulty, I found Twisty Planets’ gravity and perspective-based puzzle-platforming to be pretty tough as I got further into the game. While some could be attributed to the isometric view itself as well as the control scheme (Qub can only be controlled diagonally, with each movement direction mapped to a corner of the screen) the rest is due to well-designed levels. There’s a bit of a learning curve to mastering the controls, as I found myself spinning the world in different directions than I intended. However, once you get train yourself with the rules and controls that Twisty Planets offers, the increasing difficulty becomes an enjoyable rather than tedious element. In addition, I really enjoyed Twisty Planets’ overall presentation. The visuals and music had a calming effect that I can really appreciate in puzzle games. Sure, there’s a timer and 3-star system, but Twisty Planets offers the choice of either pursuing that kind of challenge or simply going at your own pace. I think its look and feel contributed greatly to why I didn’t feel much in terms of frustration even when it became difficult. It’s a small facet to the game but becomes incredibly important as you get more invested solving its puzzles. Twisty Planets probably won’t be converting any non-fans to the genre, but for those that appreciate this brand of puzzle-platformer, it’s well worth playing. I’m a fan of the gravity mechanics, and there’re plenty of levels and enough of a difficulty curve to keep players busy for awhile. Veteran and newbie fans of the gameplay should simply check it out.